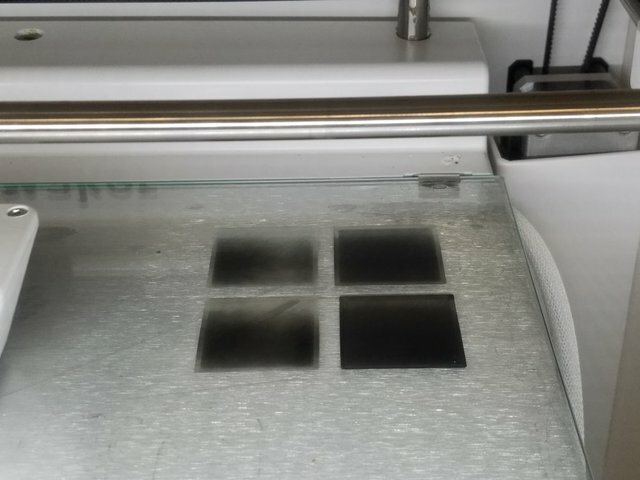 I'm using an Ultimaker S5 to try to print ferroelectrets from black ABS, and I'm having an issue with getting the first layer a consistent thickness. The first layer is generally about 50 μm, which should be doable with the S5 and the head we're using. What I find is that I have no problem getting material to extrude, but the thickness of the first layer will vary anywhere from the correct thickness to being so thin as to be nearly transparent. In all cases there is extrusion, so I don't think this is a problem with extrusion or adhesion, just the height of the head over a build plate that does not have a perfectly uniform height. I have observed that the glass build plate has a small gap between it and the bed in the middle that decreases as you head toward the corners where the metal clips are. Both plates we received from Ultimaker show this minor bowing, so I assume it's just how the plates are normally and that it shouldn't be a problem if the head autolevels correctly. Currently, as a work around, I find I can place the print in the back right corner and then toss "dummy" prints in the center and the upper left and it will increase the depth of the print in the back right, which is mostly OK (but still not great). However, not only does this not entirely fix the problem (even the "good" prints will have some inconsistency), but I'd also like to just be able to print what I want and only what I want so as not to waste time and materials. The pieces in the photo should all be the same. They're just copies made in Cura of the same object. So I would consider maybe turning autolevel off so that you get 100% consistent results. The glass is not as flat as you need. Even if it was, the plate beneath it can easily bend it by 0.5mm from one end to the other. So you would have to flatten the system, not just the glass. UM uses tempered glass - I believe only because it's safer if it does break. But tempered glass isn't as flat because of the way it is made. You can put tiny shims such as washers under the glass and adjust them until you get it flat enough. That is probably the path I would take (shims and tempered glass) combined with disabling autolevel, combined with only using a portion of the bed (tempered glass tends to be thicker in the middle so possibly printing around the edges). Most prints only need leveling to an accuracy of around 0.2mm or 0.1mm. So I suspect autolevel has an accuracy of around 0.1mm or possibly even 0.05mm. Which is of course much to course for you. Well imho if your glass is bowed it aint flat and no amount of levelling will make it flat - maybe you can fiddle and make a portiion of it flat big enough to get the job done. The distance between the glass and the nozzle is greater at the edges than in the centre (with your bowing) and that is why your back left will be working fairly well because the distance is greater and clearly closer to what is optimum for your print. From what you say then you virtually transparent areas will be in the middle where the glass is more compressed against the nozzle. i.e. shorter distance. It all figures apart from your bent glass!